Before I begin, I want to say that the fire at Grenfell Tower in west London overnight was devastating and caused tragic loss of life. I wish to offer my deep condolences and sympathies to those who are affected and lost their loved ones in this terrible tragedy. 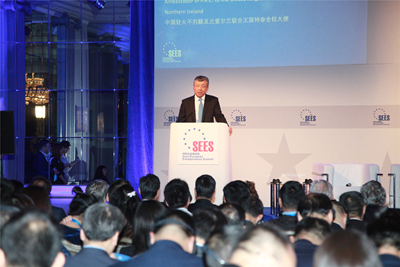 The Sino-European Entrepreneurs Summit was first launched in 2008. Since then, it has successfully brought together business, political and academic leaders from China and Europe for diverse and productive communication and engagement. I highly commend the contribution this summit has made to advancing China-Europe and China-UK friendship and cooperation. At present, the world is undergoing profound changes. A new round of scientific and industrial revolution is around the corner. Against this backdrop, this year's summit cannot be more timely. It focuses on a number of most relevant topics, including the Belt and Road Initiative, Industry 4.0, Made in China 2025 and management of multinational companies. It follows the prevailing trend of our times. And it will significantly contribute to stronger cooperation between China and Europe, and between China and Britain. I still remember last year's summit on the eve of the Brexit Referendum. Many friends from the European business community were keen to know China's view and I shared with them China's hope for both Britain and Europe. One year on, many changes have taken place both internationally and regionally, including the official launch of Brexit negotiation. But whatever the changes are, I want to stress that my confidence in China-Europe and China-UK business cooperation remains unchanged. There are three main reasons for my confidence. First, my confidence comes from the steady and positive momentum of China's economic growth. The Chinese economy continues to grow at a medium-to-high speed. The growth rate for the first quarter of this year was registered at 6.9%. In the first five months this year, China's trade maintained steady growth with import and export increasing by 26.5% and 14.8% respectively. China is making major efforts to advance supply side reform and to improve the quality and efficiency of its growth. To achieve this, we will upgrade the real economy, develop advanced manufacturing and put "internet plus" into real action. In short, the fundamentals of China's economy remain positive in the long run. China's door will open wider to the world. To Britain, to Europe and to the rest of the world, this means a vast market and huge opportunities. Last month, the Belt and Road Forum for International Cooperation was successfully held in Beijing. This Forum brought together more than 1,500 representatives from over 130 countries and 70 international organizations. It was an important platform for participants to discuss the Belt and Road Initiative and sketch out a blueprint for win-win cooperation. Based on extensive consensus, the Forum was concluded with a long list of deliverables. They range from bilateral and multilateral cooperation agreements to new pledges of financial support for the Belt and Road Initiative, from cooperation on China Railway Express between China and Europe to major projects such as China-Pakistan Economic Corridor. These outcomes were reached under the principle of extensive consultation, joint contribution and shared benefits. These outcomes will help make global growth more vibrant and inclusive. These outcomes will deliver more benefits to people around the world. The second reason for my confidence comes from the increasingly mature and steady China-Europe relations. Recent years have witnessed frequent high-level interactions between China and Europe. China-EU Summit, China-EU Economic and Trade High-Level Dialogue, and the Summit of China and Central and Eastern European Countries were successfully held. These meetings help lay a solid foundation for deepening business cooperation between China and Europe. And to further expand bilateral, regional and global cooperation. These agreements strengthened the momentum of China-Europe relations. In terms of business cooperation, China and European countries have much to offer to each other with a high degree of convergence of interests. For China, the EU has long been the largest trading partner, the biggest source of technology, and an important origin of foreign investment. For the EU, China is the second largest trading partner. Chinese companies have a high enthusiasm for investing and acquiring European businesses. Together, China and the EU are working to dovetail China's Belt and Road Initiative with EU's Investment plan for Europe. Progress have been made in building the China-EU connectivity platform. China and the EU are making good progress in their cooperation on circular economy, green development, 5G technology and finance. In the past, China-EU cooperation followed the model of "EU investment plus made in China". Now we have added more new cooperation models, such as "China investment plus made in Europe" and China-EU cooperation in a third country. Going forward, our two sides will work together to co-host the China-EU Blue Year and China-EU Tourism Year later this year and next year respectively. In one word, huge untapped potential and broad prospects await China and Europe. The third reason for my confidence comes from China-UK relationship which is full of cooperation highlights. As has been reiterated by British leaders, "The British people voted to leave the EU, but they did not vote to leave Europe". In this sense, China-UK cooperation will always be a part, and an important part, of China's cooperation with Europe. This year marks the 45th anniversary of China-UK Ambassadorial diplomatic relations. It is also a year for consolidating the "Golden Era" of China-UK relations. Despite of the uncertainties ahead in the Brexit negotiation, China-UK business cooperation remain firmly grounded and enjoys a strong momentum. Bilateral cooperation is still expanding in areas such as infrastructure, equipment building, high-tech, new energy and financial services. The growing cooperation between our two countries in these areas defines what "Golden Era" of bilateral ties truly means. Since early this year, the first freight train of China Railway Express made a round trip between China's Yiwu and London. For the first time, China and Britain established overland trade link. In March, Hinkley Point C saw the placement of the first structural concrete at the technical galleries of the plant. Also in March, China's Geely Group invested 250 million pounds in Coventry, setting up a new auto factory. This was the largest single green field investment that a Chinese company has ever made in British automotive industry. Looking into the future, there is historic opportunities ahead for China-UK business cooperation. Britain boasts world-leading innovation capability and an advanced high-end manufacturing sector. China is strong in production and manufacturing, and is working hard to upgrade and transform its industrial system. Our two countries can form a stronger synergy between our respective development strategies, such as between China's 13th Five Year Plan and Britain's National Infrastructure Plan, between Made in China 2025 and Made in UK 2050. Britain is a key partner in the building of the Belt and Road. British experience in financial and legal services, project management and risks control will have much to offer in such partnership. Under the Belt and Road framework, China and the UK can join hands for trilateral cooperation in a third country. This could well be a new growth point of the Belt and Road building. The snap election is just over and the new British Government is in place. It is expected to start Brexit negotiation with the EU soon. We in China always respect the choice of the British people. We always approach the cooperation with the UK and the EU from a long-term, strategic perspective. We hope that the negotiation between Britain and the EU will result in a win-win agreement for common development. "Market vitality comes from the people, especially from business leaders and their entrepreneurship. " I hope the gathering in London today, of business leaders from both China and Europe, will also release the power of entrepreneurship. 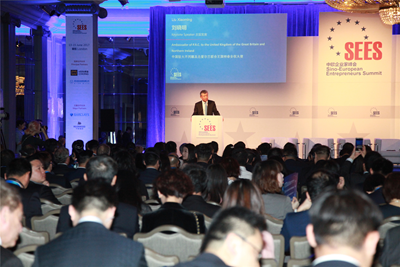 As long as we keep up the spirit of entrepreneurship, tap into the market vitality and deepen our communication and cooperation, we will definitely be able to push China-Europe and China-UK business ties to a new high. 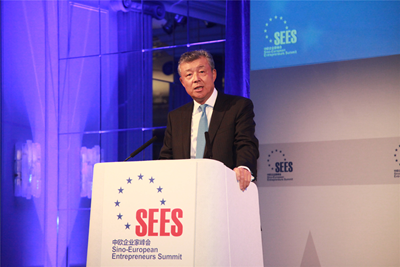 In conclusion, I wish this year's Sino-European Entrepreneurs Summit a complete success!